Manufacturer and Exporter of RF, Microwave & Coaxial Connectors. 1. 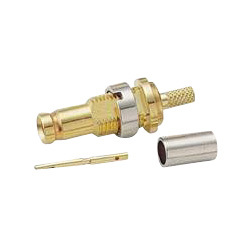 1.0/2.3 connectors feature a slide-on coupling mechanism to prevent accidental disconnection. 2. The 1.0/2.3 series are suitable for applications up to 4 GHz and especially ideal for telecommunication systems. 1. Plug: (1) Body, metal parts: - Brass per QQ-B-626. - Finish: Nickel. (2) Outer contacts: - Phosphor Bronze per QQ-B-750. - Finish: Gold. (3) Center contacts: - Brass per QQ-B-626. - Finish: Gold. 2. Jack: (1) Body, metal parts: - Brass per QQ-B-626. - Finish: Gold, nickel. (2) Center contacts: - Beryllium copper per QQ-C-530. - Finish: Gold. 3. Insulators: Teflon. 4. Crimp ferrules: (1) Annealed copper (2) Finish: Nickel or gold per requirement. 2. Frequency range: 0 ~ 4 GHz. 3. Working voltage: 250 VRMS max. 4. Dielectric withstanding voltage: 750 VRMS min. (2) Right angle: 1.5 max. (1) Center contact: 6 milliohms max. (2) Outer contact: 3 milliohms max. 7. Insulator resistance: 1000 Megohms min.